I don't usually like to show bad things in my blog but lately, I have heard so much bad stuff about the police in general that i thought I would show a picture of how wonderful they usually are when we need them. These people have to deal with the unthinkabla, day after day. They protect and look after us when we need them and occasionally when a minority does something bad, the entire police force gets the criticism. 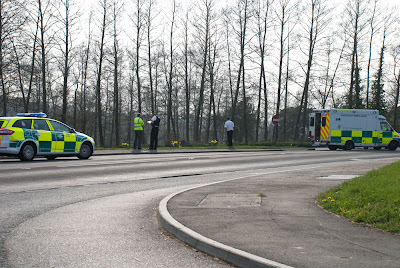 Anyway, this time they were dealing with a pretty nasty accident on the A28 Canterbury to Ashford. I love the starkness of the trees contrasted by the brightness of the fluro. Good shot and hats off to those who serve their community.